USA: Elite TVs about to reappear in Pioneer retailers (Calm down, dear – they're not Kuro) | What Hi-Fi? It was hardly the best day ever to launch a premium TV range: as the world's stock markets went into freefall, the alliance of Pioneer and Sharp rolled out the long-awaited Elite TV line-up, the result of Sharp's licensing of Pioneer's high-end sub-brand. 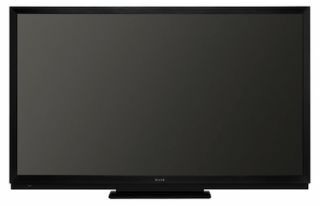 Two models were announced in New York this morning: a 60in with a $5,999 price-tag, and an $8,499 70-incher. Both will be available later this month through selected custom-installation specialists and Pioneer Elite dealers in the States. But while that'll please those Pioneer retailers who'll now have a display to sell alongside the company's Elite range of 'home theatre' electronics, the wistful Kuro fans won't find much to celebrate here. These aren't Kuros; they're not even plasmas. In fact, the two TVs use Sharp's Quattron LCD display technology, which adds yellow to the usual red, green and blue used to create the image, coupled with a full-array LED backlight system complete with local dimming. The displays are both THX and ISF certified, and have all the current bells and whistles, including 3D functionality (with two pairs of active-shutter glasses supplied), connectivity to Netflix, VUDU, YouTube and other streaming services, and Skype capability (though the camera kit's an extra-cost option). They also have a range of extra features, including Elite Pure Mode, designed to replicate the settings of past Elite TVs, and Elite Advantage LiveSM, which enables a personal advisor to 'dial-in' to the TV via an internet link and provide services such as set-up, picture adjustment and basic calibration. In other Pioneer-related news, the company is going into the camera business. It's setting up a partnership with Chinese electrical retailer Suning and Taiwan-based manufacturing service Asia Optical Group, and will have digital cameras on sale in China by October. The sales target is 500,000 units per year by 2015, and the move will also see major growth in the availability of Pioneer products in China: Suning is expected to more than double the range of Pioneer products it sells, and the number of Suning stores selling Pioneer is expected to top 1000 within three years, more than tripling the current number of outlets.